I am so turkeyed-out! What I need tonight is beef. As luck (and a little planning and foresight) would have it, I have Seared Sirloin with Caramelized Onions and Gorgonzola on the menu. Paired with a bottle of Sullivan Vineyards Cabernet Sauvignon Napa Calley 2012, it was just what the doctor ordered! Honest, there’s a Gorgonzola-smothered steak under all those caramelized onions. My wife’s initial reaction: “Oh, that’s smooth. Very nice.” Thus the stage is set for this excellent Napa Cabernet. Deep, inky purple in the glass. Aromas of blackberry bramble, tobacco, smoke, and spice. On the palate there is blackberry, cassis, pepper, black cherry, and hints of oak. And those tannins – dry, but oh so smooth. It’s hard to believe this is only a 2012. The finish lingers with dark berry and tobacco. This day-after-the-day-after-Thanksgiving, I’m thankful for beef. Some day my wine cellar will look like this. We all have dreams, right? I am a condo dweller. I have no basement. I do not have sufficient space for a large wine refrigerator or upright cellar. Instead, I have a 34 bottle chiller. (Why 34, Vinotemp? Why not an even 3-case 36?) With the bin at the bottom, I can squeeze in a few extra bottles, expanding my capacity to 38 when needed. I have some shipping packaging in an interior closet to stack my occasional overflow, but for the most part, I’m limited to about 3 cases of inventory at any given time. The truth is, since I’m not a collector, this is ample storage. But I can still dream, can’t I? When our son left the nest a couple of years ago, we converted his room to a home office. While the room is occupied, I have my eye on his walk-in closet. Currently it is full of storage, but in my mind’s eye, I can see it lined with wood racks, sealed, and a compressor installed. Can’t you just imaging that mirror replaced with a glass viewing panel? Dreams can come true, can’t they? While pondering what I’d do with a 200+ bottle cellar, I thought about what wines I currently have in storage. As I say, I’m not a collector. My oldest bottle is a 2007 Silver Oak Alexander Valley Cabernet Sauvignon. I’m holding it for another couple of years, with the intention of opening it in 2017, when it is 10 years old, for our 33rd anniversary. I know for some enthusiasts, 10 years is not a long time, but when you’ve limited space, it’s pretty darn long! As a member of NakedWines.com, I have a lot of their wines. In fact, 18 of 33 wines in my current inventory are from NakedWines.com. Of these, some are “special” wines, including a 2010 Gianfranco & Serena Cordero Barolo DOCG, that I’m planning to hold for at least five more years. Other, non-NakedWines.com wines in my chiller include several Sauvignon Blancs, left-over from the dog days of summer and my 2015 Sauv Blanc obsession, and a Montepulciano D’Abruzzo, my new favorite Italian red. I also have a couple of Cabernet Sauvignons; St. Supery and Castillo di Amorosa, from our Napa mini-vacation this summer. For that obligatory bottle of bubbles, I have a Zonin Prosecco. Frankly, I think I have a bunch of great wines on hand! Compared to a lot of my wine friends, it’s a small quantity, but it works for me. Some day, perhaps, I’ll be able to convert that closet, but until then, my 34 bottle chiller works just fine. Which brings me to my original question: What’s in your cellar? I’m interested in what other wine lovers have in storage. Whether you have a six-bottle rack on your kitchen counter, or the cellar of my dreams, full of auction-worthy classics, please leave a comment and share some of your special bottles. I may not be able to taste them, but we can all enjoy each others wines vicariously. 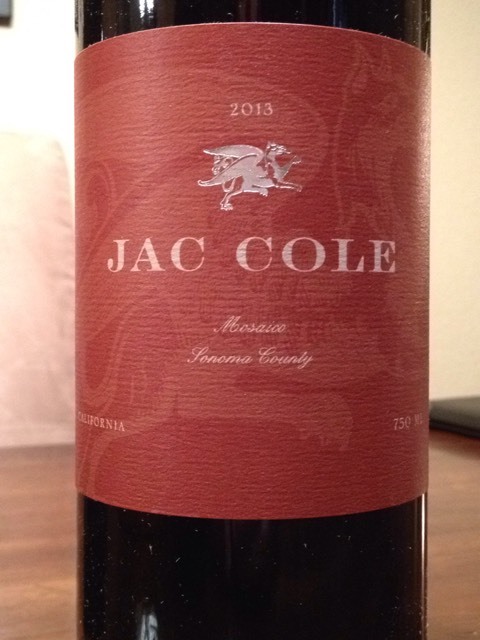 Jac Cole’s Mosaico is a wine that certainly gets better with time! Mosaico is a blend of Cabernet Sauvignon (2/3) and Malbec (1/3), and is available exclusively from NakedWines.com. As impressive as it was when I first tasted it shortly after release, after eight months resting in the bottle, the wine is now amazing! My “before and after” reviews are below. Based on several other reviews, I decanted this Saturday afternoon in anticipation of serving it with my grilled Porterhouse on Sunday evening. Of course, I had to sneak a taste. Oh, wow! This is a full-bodied, oaky, complex red blend! A blend of two “steak” reds, Cabernet Sauvignon and Malbec, this is gonna be sooooo good! After more than 24 hours of air exposure, including a couple cycles back into the bottle, then back into the decanter, it’s time for a proper taste. The nose is dried cranberry, raisin, and black cherry. There are flavors of ripe plum, black cherry, and chocolate – chocolate covered cherries! – and a hint of oak. This is a very rich wine, with thick, chewy tannins perfect for a thick, juicy steak. At this young age, the acidity is a bit brisk, but give it a few months in the bottle, and this will be a six-hearter! The first cold, rainy night this fall in NorCal. The night called for a big, full-bodied red wine. Something that would warm our bones and soothe our souls. Something that would complement our dinner of penne pasta with homemade sauce and meatballs. Something like Jac Cole’s Mosaico. I’ve been holding this, my last bottle of the 2013 Mosaico, for several months to see how it has developed. An enticing blend of Cabernet Sauvignon and Malbec, it has developed beautifully! Black cherry and soft oak on the nose. Ripe blackberry, cherry, and black pepper on the palate. Soft, velvety-smooth tannins with light acidity. Chocolate covered cherries on the finish. And exactly the warming, delicious feeling we were looking for tonight. In my original review, I rated this 4.5 hearts, noting the tannins were chewy, and the acidity a bit brisk. Eight months has resolved this and, as I predicted back then, this is now a 6-heart wine! Unfortunately, the 2013 has long since sold out. 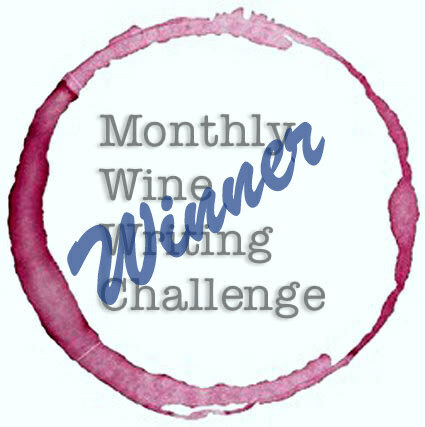 However, if you’d like to try the next vintage of Mosaico, or any of the other fantastic wines available only through NakedWines.com, click here for a voucher worth $100 off a first-time order of $160 or more. Satisfaction guaranteed! 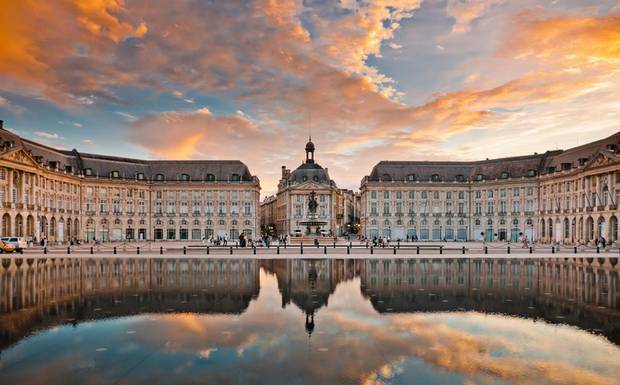 Bordeaux. The name evokes images of luxury and glamour, Downton Abbey-esque dinner parties, and the ultimate in fine wine – the standard against which all other wines are measured. This is not undeserved; Bordeaux is very good wine. It is one of the most recognized names in the wine world. As such, it is also misunderstood, and intimidating to many people. 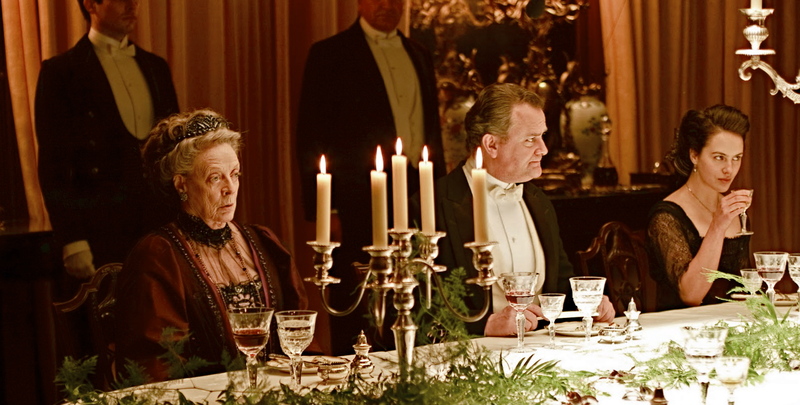 A while back, I invited some friends over for dinner, and to share a bottle of Bordeaux. This particular bottle, a $60 Saint-Émilion (obviously not a Grand Cru, but a very nice wine), had been sent to me to review, so I wanted to share it with people who would appreciate the quality. These friends are into wine, but drink mostly California wines. I opened and decanted, and when dinner was served, poured the wine. As they tasted, I explained that as a Right Bank Bordeaux, this wine was predominantly Merlot, blended with Cabernet Sauvignon and Cabernet Franc. The looks on their faces betrayed their surprise. “Bordeaux isn’t a grape?” one of my friends asked. 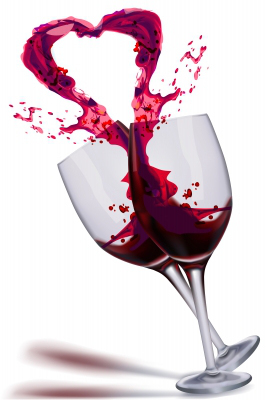 Old World wines can create confusion to American wine drinkers. 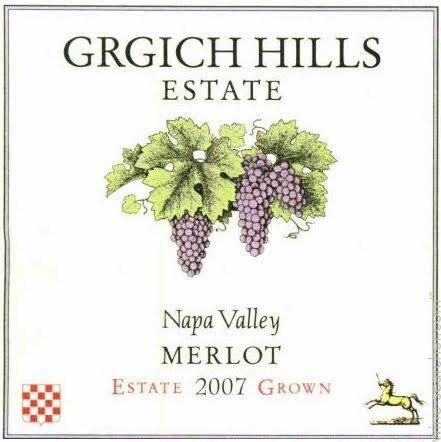 Had I served a Napa Valley Merlot, the label would say “Napa Valley Merlot.” A red blend with less than 75% of one varietal would say “Red Blend” or something similar, and often lists the grapes on the back label. European wines, on the other hand, name the region on the label, but usually not the varietal. There, people just know that Red Burgundy is Pinot Noir, Chianti is Sangiovese, Rioja is Tempranillo, and Bordeaux is a blend of Cabernet Sauvignon, Merlot, and other grapes. 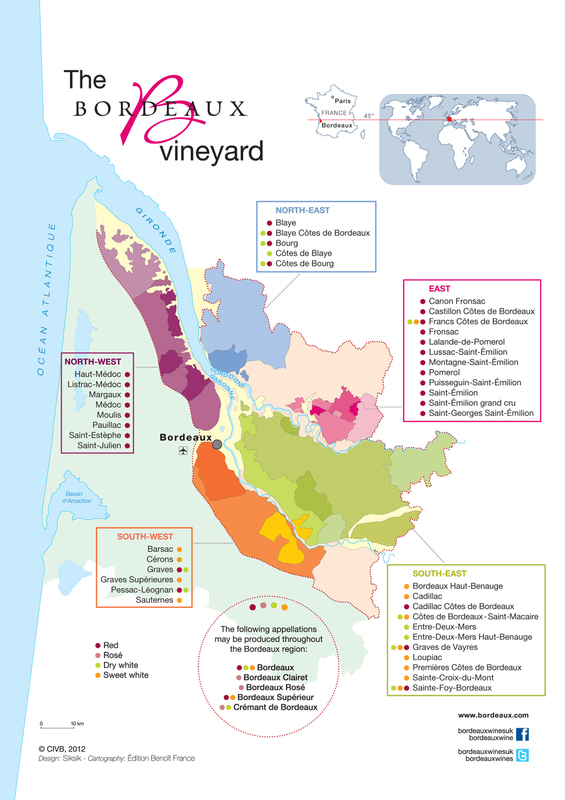 The Bordeaux region is in southwestern France, along the banks of the Gironde river. The predominant red grapes are Cabernet Sauvignon and Merlot. Historically, red wines from producers on the Left Bank of the river are Cabernet-based, while those from the Right Bank are Merlot-based. Other common varietals, used for blending, include Cabernet Franc, Petit Verdot, and Malbec. As mentioned, Bordeaux wines are renowned for their quality, their aging potential, and their glamour. While high-end Bordeaux, Grand Crus, can fetch thousand of dollars per bottle, there are plenty of very good Bordeaux wines for less than $20. Check your wine shop or market, and try a bottle! 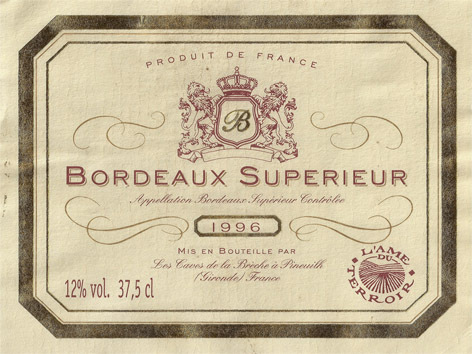 Bordeaux has earned it’s reputation for a good reason. Just don’t look for a Bordeaux grape! “…she’s amazing, she’s eccentric, some might even say barking mad…” That’s the teaser on the label to describe this delightful Sauvignon Blanc. In my ongoing exploration of Sauvignon Blanc, I found this fun bottle. Mutt Lynch winery themes all their wines around dogs. And for good reason. Mutt Lynch donates a portion of the profits from each bottle they sell to animal rescue organizations. If that isn’t reason enough to support them, their wines are really good, too! well-balanced wine. Fou Fou for you! Straw color with soft aromas of elderflower and white peach. There are flavors of gooseberry, honeysuckle, and pear, with mango and papaya on the finish. The fruit flavors drive this wine, giving it a sweet profile although it is not a sweet wine. The mouthfeel is soft, almost creamy, with very smooth acidity. This is a very easy-drinking, tropical Sauvignon Blanc. Purchased from Underground Cellar, $13.00. Fou Fou le Blanc is delicious on its own, but it really shined when we paired it with Coconut-Crusted Mahi Mahi with Horseradish-Orange Marmalade. Spectacular pairing! 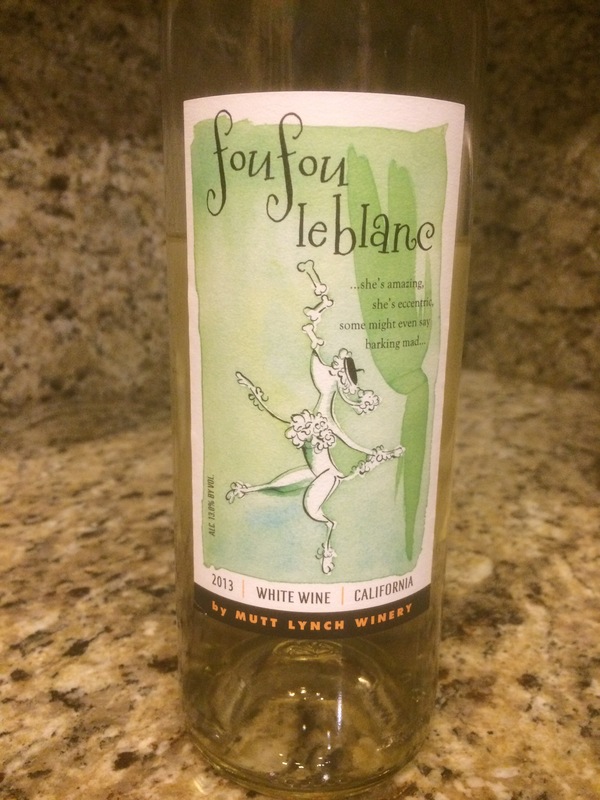 If you get a chance to sample some Fou Fou le Blanc, or any of Mutt Lynch Winery’s other wines, don’t let it pass you by! You’ll enjoy the wine, while supporting animal rescue efforts. That’s a win-win!